I love Stephen King and It is my all-time favorite. So I totally LOLed when I saw this British news article. Apparently, someone (or maybe multiple people) is dressing up like a clown and bombarding people in the streets. I have no idea what the motive is here but if it’s to be freakin’ hilarious, then you have succeeded, sir. I especially love that people are really freaked out about it. It just goes to show that clowns really are terrifying to most of the population. I’m not scared of clowns, per se but I do think they’re kinda creepy. Even if they’re trying to be all happy and kid-friendly. I’m going to go out on a limb here and say that clowns should be banned. I mean, really, if a guy in a clown suit can put an entire town on edge, there’s something wrong with the institution. So I guess the person who vandalized the Derry town memorial statue was right. 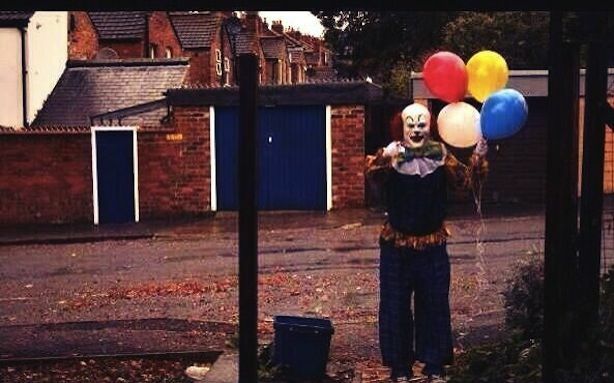 PENNYWISE LIVES! This entry was posted in Uncategorized and tagged clowns, Humor, Stephen King.